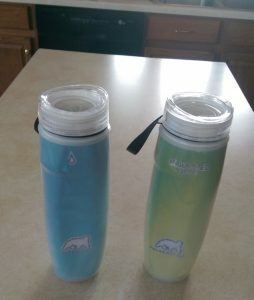 One of my kitchen cabinets always seemed like it filled up with new freebie water bottles faster than I got rid of old ones—there’s a photo in this post. Recently my husband went through them again and pitched most of the water bottles at the back of the cabinet. He pointed out that they hadn’t gotten any use at all since our daughter moved to Cleveland, and she hadn’t used them much anyway. Much better—the Polar Bottles are very well insulated. When we put ice water in them before we go rowing, the ice melts so slowly that there is still some ice left when we get home, even on a warm and sunny afternoon. Even though water bottles are just everyday consumer items and not expensive, they’re a great reminder that the modern world is full of “cool” new stuff to appreciate! “Cool” 🙂 I use a life factory water bottle everyday all day and it is hard for me to tear myself away from it for the few hours it’s in the dishwasher. It doesn’t keep things that cool though. That would be handy on a hot day! I like this post category. Thanks for sharing!